Colony collapse disorder, the mysterious mass die-off of honeybees that pollinate $30 billion worth of crops in the U.S., has been well documented, with toxic insecticides identified as the primary culprits. Now, scientists at the University of Maryland and the U.S. Department of Agriculture have expanded the identification of components of the toxic brew of pesticides and fungicides contaminating pollen and decimating the bee colonies that collect it to feed their hives. 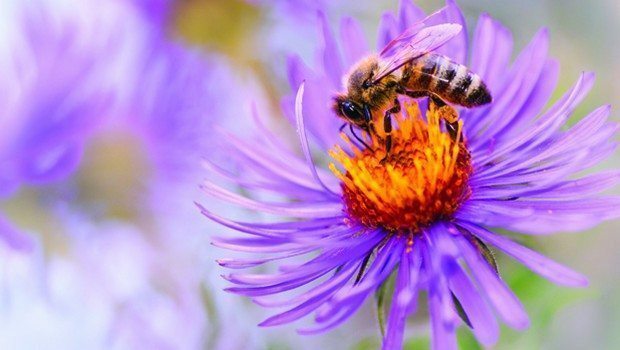 A study of eight agricultural chemicals associated with increased risk of infection by parasites found that bees that ate pollen contaminated with fungicides were three times as likely to be infected. Widely used fungicides had previously been accepted as harmless for bees because they are designed to kill fungus, not insects. Dennis vanEngelsdorp, the study’s lead author, states, “There’s growing evidence that fungicides may be affecting the bees on their own, highlighting a need to reassess how we label these agricultural chemicals.” Labels on pesticides warn farmers not to spray when pollinating bees are in the vicinity, but such precautions have not applied to fungicides.